Evelyn A. 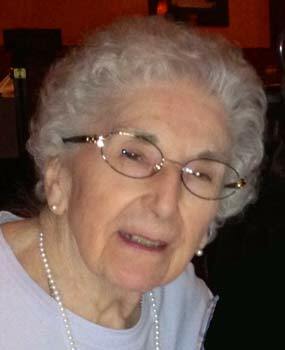 “Bunny” Stolfa, nee Wertz, 94, resident of The Danish Home of Chicago. Beloved wife of the late Frank R. Stolfa. Loving mother of Ellen Frances (Kenn Rowe) Stolfa and the late Robert Leo Stolfa. Proud grandmother of Robert Rowe. Dear sister of the late Kathryn Wertz, the late Rosemary Wertz, the late William Wertz, the late Bernadette Peters and the late Helen Isenbeck. Dear aunt of many nieces and nephews. Graduate of Saint Scholastica High School Class of 1941. Visitation Thursday, January 17, 2019 from 3 until 9 PM at the M.J. Suerth Funeral Home, 6754 N. Northwest Highway, Chicago. Funeral Friday with prayers at the funeral home at 11:00 AM, proceeding to Immaculate Conception Church, Harlem and Talcott Avenues, Chicago. Mass 11:30 AM. In Lieu of flowers memorials to The Danish Home of Chicago, 5656 N. Newcastle Ave., Chicago, IL 60631 appreciated. Interment Private. For further information 773-631-1240 or www.suerth.com.